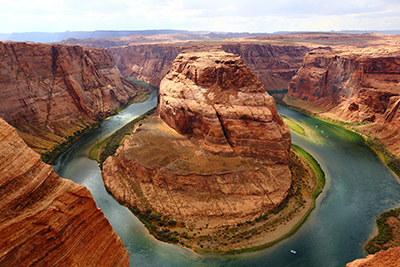 If you want to enjoy an unforgettable experience at the Grand Canyon, your best option is to book an RV rental for your trip. A recreational vehicle will give enough room to pack all the supplies you need for this exciting journey. In addition, the Grand Canyon is located on rugged terrain, so you need a tough vehicle to navigate the nooks and crannies of this challenging but delightful place. The Grand Canyon is located in the northwestern corner of Arizona. Some of the closest cities to the Grand Canyon are Tusayan, Kingman and Flagstaff. The Grand Canyon is 277 miles (446 km) long and 18 (29 km) miles wide. It has a depth of 1.85 meters and its highest point on the South Rim, is approximately 7,000 feet (2,100 meters) above sea level. Clearly, this place is special and this is why it attracts millions of visitors every year. In our opinion, the best mode of transportation for people traveling to the Grand Canyon is an RV rental. However, you cannot just drive down without planning your trip. You need a reservation because this place attracts millions of visitors annually. The helpful team at Inland Empire RV Rentals is happy to help guide you as you make plans for your voyage. You have a reservation, you have booked your RV rental and you have arrived safely at the Grand Canyon. Now, it is time for the fun to begin! The North Rim Visitor Center is the perfect place to begin your adventure. At this center, you get maps, a brochure and interpretive exhibits. If you have any questions, just talk to a ranger and you will get all the answers you need. This place promises you a terrific experience because there is just so much to do and see. You can hike, walk, camp or simply ride a mule. You can visit the museum and the information center or take a drive in the desert. Some of the activities you can enjoy at the Grand Canyon include the ones below. RV camping is one of the most popular activities here. You can jump into your vehicle and drive to the camping site at the North Rim. Some of the campsites here are managed by the Kaibab National Forest and they offer excellent facilities. For raft trips on the Colorado River, you need a reservation well in advance. These trips last for 3-21 days so this gives you many options. Sign up for the Whitewater trip or the Smoothwater trip and have fun on the Colorado River. The mule ride is a great experience. In the North Rim, mule rides are available from May 15 through October 15. Your options are the one-hour ride or the half-day trip. In the South Rim, you can enjoy mule rides all year round. A three-hour canyon vista ride takes you along the canyon rim. If you are an excellent horseman (mule-man in his case), you can try the overnight ride. A trip to the Grand Canyon is a great experience. This place offers you fun, adventure, information and education. Rent an RV, take a trip to this wonderful place and you will enjoy the experience. If you would like to get information via email or would prefer us call you back, use this form to get in touch. We will usually respond the same day on business days, and can accomodate your reservations as well."